Dont push it with the hands! As eager as I am to see something new, it already disturbs me to have seen several comments by you of trouble drawing due to hand pain… Would hate to see you push yourself to a point where you can no longer share your incredible gift with us! Here’s to a great 2012 and an even brighter future for you, Craig! Looking forward to what your new book is all about. And hope your hand heals up. Can’t wait but please take your time!!! Merry Christmas Mr. Thompson!!! Have you attempted ambidexterity? 😀 Anyhow, can’t wait to see future work! So excited, this really looks like a lot of fun. I loved Habibi but I missed your sillier side! Oh, man. Sorry to hear about your hand, though it sounds like you’re close to a full recovery. This book looks like all kinds of crazy! I’m guessing that it’ll be in full color – will you be doing all the coloring yourself? Anyway, it’ll be a welcome addition to the Graphix imprint. They’ve been kind of hit-or-miss for me and a lot of people I’ve talked with. Hopefully it’ll keep the successes of Smile, Drama, Bone and Amulet thriving. Man I wish there were some oversized prints of stuff from Blankets or Chunky. Get better Craig, try to tour some places in 2013 please. 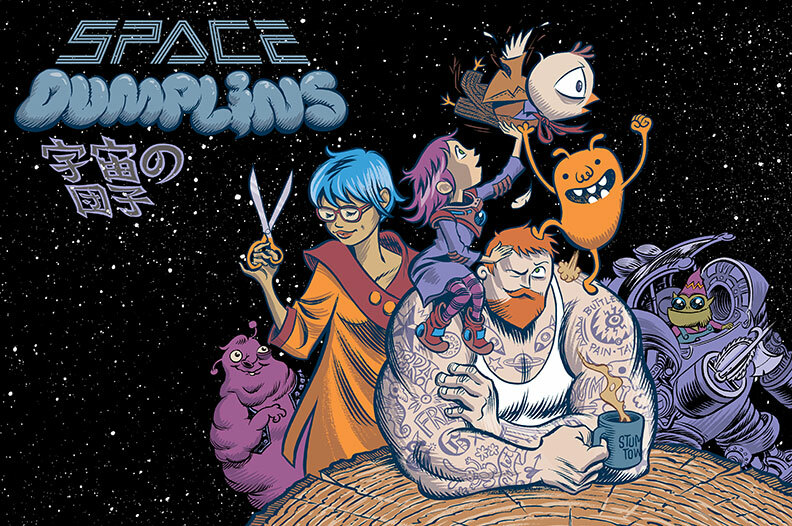 Space Dumplins looks good! Hope your hand gets well soon. A toast for a great 2013 to everybody! BTW, where is your first 2013 post? Hey Craig. Love your work and this new project looks really exciting. Having said that, it was unfortunate that you couldn’t make it to Pakistan for your tour. The relevance of Habibi to the social climate here is strong. On that note, have you followed the attack on the young social activist Malala Yousufzai? It would be wonderful if you could provide your thoughts in an article about the incident. Please take your time Craig, only draw when you feel comfortable to do so. As much as I am dying to see this new work, I do not want it to be in exchange of permanent injury to your hand. Before I go just want to say thank you so much for Blankets and Habibi. There were so many similarities to my own life reading Blankets, it not only a work of great art and beauty, but holds a deep and almost poetic resonance for me. And Habibi – mesmerising stuff. I still cannot get some of the moments, the images out of my head, so powerful is its message. I hope your hand has healed. Your work is brilliant and I look forward to what you will publish next. You a master story teller and your rendering is simply superb. A treat for the eye and the mind.